An exhaustive list of things to do with your pet in raids would be well... exhausting. Most fights require some pet management. 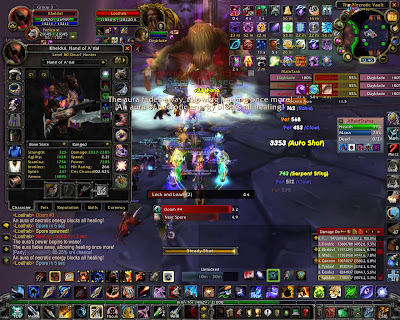 So if you're paying attention to yourself and neighbors and environment and trying to dps, keeping situational awareness of pet is usually what falls off the table. A part of your brain needs to keep tabs on your pet. Not as big part as BRK has.. but some decent awareness and expectation of problems. Okay, so fine. No biggie. Being SV, if I lose my pet, I lose some dps. 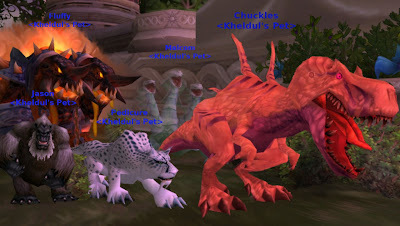 If I were BM, if I lost my pet, I would have lost my dps. Luckilly, for BM they usually can rez quicker and more effectively the old way or the new way. I'm usually happy when I get my pet through the flamewall and void zones of OS-nD, the Safety Dance of Heigan, the voids of KT. Etc. These aren't huge accomplishments, and to be honest I probably am only batting .500 most nights. Of course the problem with pets is more than Pet Management. There are many fights where your pet dps simply takes a nosedive because of the Fight Mechanics. Thaddius is a good example. Pets thankfully do not get the charge. While this means they don't routinely wipe the raid, it also means their reletive dps is a small fraction of what it is compared to everyone else. Pets in P1 of KT.. not so useful. Malygos is another example. P1 has many pet management issues and some mechanics issues. Trying to get your pet to stand in the sparks is a messy art. Most of P2 is mechanic issues that don't let a pet do much. And of course P3 is just, IMHO, not the best mounted combat finish. So in summary: 1) Pets are great. 2) Pets have many but certainly not all of situational awareness demands on them as normal players. 3) Pets are second-class in terms of fight mechanics. The patch notes are in error. TnT gives % damage to Explosive Shot, Immolation Trap and Explosive Trap and that’s it. It does NOT refresh the duration of anything. Sorry for the confusion. The patch notes are like 20 pages long and we've gone back and forth on a few things. This is a bit confusing. It would seem like our LnL procs will be far far less if there isn't another mechanic made available. As you might have picked up from my previous trivia screenshot, I like to do the new BGs. 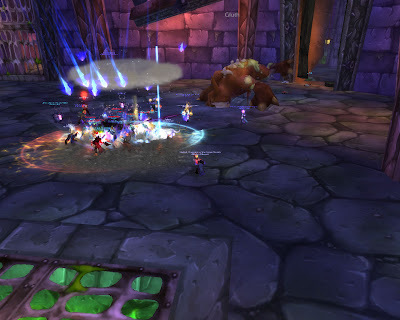 I think it's still true that a well-coordinated raid can win any of them easily. However the pugs seem to stand up a lot better. Individual achievement seems to matter more. In Strand of the Ancients, two good players can win the game. As a hunter, you're probably better off riding shotgun on a tank. Outfitter is good here. Start off in your normal PvP gear. If you drive the tank, stay in it. Generally on the beach, I'll head for the side with two tanks already hitting a wall, driving right off the dock. If I manage to get in a tank with an experienced driver, it's fairly golden. In that case however, I'll usually flip out of my PvP gear and into dps-PvE gear. While riding shotgun, you want to weed the field. You also primarily want to keep melee the hell away from the back of your tank. Generally speaking, concussion shot is pretty good here. I use that all the time vs mounted opponents. It's also great against melee to keep them a little out of range of dps'ng the tank. Wyvern Sting on casters is great. CC them and forget them unless they immediately break it. Use Frost Arrows every 30sec. I am still building my PvP set. 415 resilience isn't horrible. I have enough to buy a few more pieces, but I'm holding out for 3.1. I believe there are upgrades on the way. There is one that looks pretty tasty. Neat feature on WWS. Drill in on your character and then click on Buffs & Debuffs. It will show uptime of proc/use type items. If you narrow it to just a particular boss it is most valuable. Unfortunately for me it doesn't show my providing Replenishment uptime. If it did, I could toy with my talent points and find a good break point. At the moment, I don't know if I'm at 100% or 31% uptime. :-/ I'd like to see if I can reasonably trim Hunting Party down to rank 1. Or at least know if my rank 2 is doing the job. 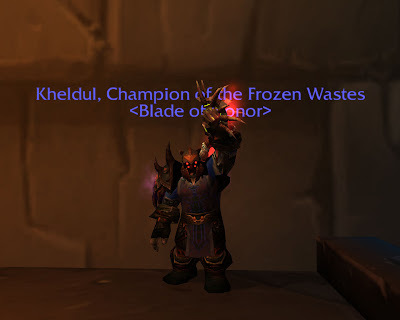 Notice anything wrong with this screenshot while I was in Wintergrasp? Sure lots of horrible bugs and things akin to exploits are possible there. Just from memory here's a list: Demolishers going through inner walls, defenders not being able to get up on the walls to hit ranged attackers who parachute in, people re-logging in with full First Lt vehicle purchasing rights two seconds into a fight, people re-logging inside the vault and clicking the orb when the door is barely scratched, etc. But no, it's simpler than that. Got it already? Good. Of course I had a quandary. I had three BG quests to turn in. So what did I do? I hoofed it to buy another resilience piece and came all the way back. Maybe it's just this week. I've been on a never-ending treadmill of things to do. Every time something is achieved a new thing I need to take care of comes up. And the pager has been less than silent. So that doesn't allow one to really enjoy Wow.. or anything perhaps. So, while we had a fairly good run in Naxx, my heart just wasn't in it. I even played around in Gothik for the first minute and just didn't DPS, but just ran around and danced on the walls. Things were going a little slow. The group make up was off. (Five tanks!) And of course maybe the content is just less than exciting. There was one interesting thing we did. Normally on 4-Horsemen, we have the tanks taunt-twist the front two horsemen, while equal amounts of dps burn them both. (While of course just tank-heal-switching in the back.) Well this time we just stacked all our dps on the metor guy with one tank+heal on the front right guy. We burned the front left guy down in two stacks, moved to the front right guy, burned him in four stacks and then spread out and burned the back guys. It was certainly faster. No achievement, but neat. Looking at my WWS report, I had one missed shot with my 7.99% to hit, and my pet stayed the same as last week with about 7% miss. (Oh, and don't look at non-boss fights. 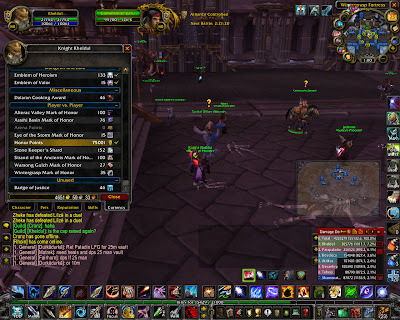 The person logging was also running master loot so he wasn't in range of most trash.) Of course the +hit issue is all moot with new loot. I moved up one step with ranged weapon and pants. I was reluctant to leave my gun, but this is the second-best in the game. And it has +hit. Enough such that I replaced another gem with +16 agility. At least the best is a gun and something to look forward toward. Dwaves and guns are just meant to be. The pants were also a little difficult. It's another break of my T7.5 set. But again, they're a 9dps up according to the spreadsheet. Once again, thanks to my bracer upgrade, I'm slightly under the hit cap. How far? Well unfortunately 1 pt. If I was 7pts or 8pts under, it would have been an easy gemming choice. But I was 9pts under the cap. So, I have 7.99%. And of course my pet because of silly-bad Blizz mechanics, has a +7.00% hit. I think I heard that this int() operation (aka rounding down operation) was changed in 3.1. I was just too reluctant to throw away 7pts of hit... and it's not like I'm BM spec or something. What will I be in 3.1? MM sounds low, but I haven't tried it since I was lvl69. BM is fun and I could visit my pets, but it may not DPS well. But I could spec pet tank and build up a gear set and button bar for it. I would not mind being an OT. Maybe BM will be top hunter dps once again? What then? SV is fun and difficult to optimize -- generally a challenge -- who'd give that up? Well, I guess I would if it couldn't end up with better DPS than another talent tree. Hmmm. I do like being able to provide replenishment though. So, I'm looking at BM OT'ng and Relenishment as two possible fun utility specs. DPS as the primary. Currently, I'm sacrificing a little DPS to provide relenishment as I don't respec based on who's in my raid and whether I think they'll live through a fight. Hmmm. This was from a few days ago. We beat down Sapph and KT again this evening. I won the quest for Malygos. Then we had a good two hours to figure out Malygos. A bunch of people had never seen him before. We had some nifty random damage that supposedly is fixed in 3.1. We got him to a little under 2% on the 4th try. And then we nailed him on the 5th attempt. Awesome job. I got to loot his heart and got the nice quest item. Nope! Not the awesome one. But it is funny looking with a red glow on it nonetheless. Is nonetheless even a word? Cleared four wings of Naxx last night. 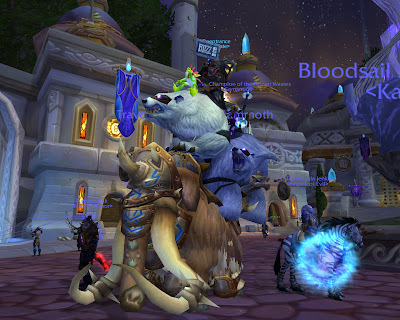 Not our fastest for sure, but we got Thaddius down with two people who hadn't seen the fight before. Also had a Pally healer switch to tank, and a pally tank mostly in blues as another tank. Luckily, we had a regular OT/MT as MT. Our stand-in tanks did great. A little goosey on Patchwerk, but that's not the easiest to walk into. We also had strange imbalance. A bumper-crop of hunters (BMx2, MMx1, SVx2) and boomkins. Not our normal fare. Arrowsong dropped again last night. I passed. I really should get it ... just like guns a little more. Okay. A lot more. However it would be a fairly decent up. It'd take away some more of my +hit gems too. Here's a WWS if you like to chew. I'm Phobos. Oh, and I and three others got instaGlib'd on 4 Horsemen half-way through. I was at nearly full health. I was only getting stacks from the back-right horseman. Had two stacks ... was thinking of where to run and not hit black circles on the other side, and then boom! Took a 116,846 Holy damage hit. EDIT: I forgot anonymous WWS change the names each time you go to it. So... ummm. I'm the hunter that did 4845 dps on the sketchy Patchwerk kill. 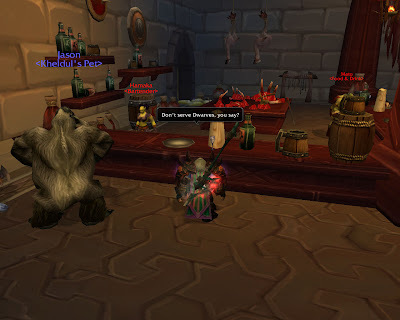 We were MD'ng like mad for the novice Pally MT... had to brez him once or twice... I was eventually trap-dancing, but there was no calm watch-the-cooldowns rhythm. So, I got the 10man Naxx rifle on Friday. The spreadsheet says it will be 0.61 dps higher than the crossbow. Yes, that's less than one dps higher. And that's with full 25man raid buffs. But I'm a dwarf. I need a gun. So I put a scope on it. I vendored all my BoP arrows. Picked up my 28 slot gun ammo bag. Filled it up with the BoP ammo. Then found out that the even nicer bullets are much more scarce than the arrows. It's better to look good than to feel good. Simply put, the WoW engine doesn’t update your position until you hit the ground. When you are airborne, as in jumping, the game engine doesn’t know where you are anymore. The interesting thing is that the server doesn’t instantly update your position when you’re running forward. It does however update whenever you strafe - so you do want to strafe out of death zones, and when doing Heigan it’s also a good idea to strafe just a little - not a lot, since it will slow down your movement, but just a tap now and then. I will find it hard not to jump. But I'll also find it hard not to think about this article. So, I picked up one of the two Grim Toll drops last night. That let me scale back my +hit gems from 8 down to 5. It will also give me an extra talent point back. Now I just have to figure out where to spend it! All in all it was a very good night. We cleared three wings very fast. 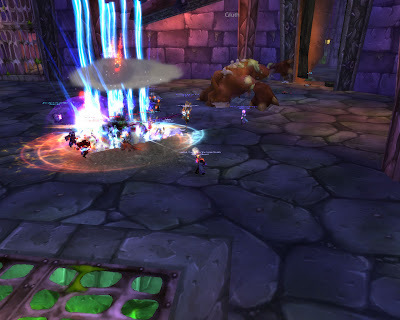 Around the third hour (midnight ET) we hit Thaddius and wiped three times. The first was the most bizarre thing. It was on his minions. One of the tanks DC'd. So all of a sudden one of the two guys starts running over so that they both beat up on the one tank who isn't DC'd. Of course half the raid gets chain lightninged to death as soon as he runs down the ramp. Pretty funny honestly. However, it is a long run back. Tiring, perhaps. So then two attempts and we lose people the each time off the bat. I think two people were new to the whole thing. :( So two runs back and a final wipe and we call it. Very close to doing four wings in 3-1/4 hours, which felt like a nice brisk pace. We also had every dps putting out 100-600 more dps from the last raid on the same content. Also pretty nice.